My wife, a former farmville power player switched to CityVille a few weeks ago. I had to see if others did the same. I found the answer at www.allfacebook.com (my favorite site for Facebook statistics). 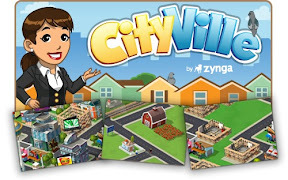 Social gaming company Zynga's latest hit "CityVille" is now the most popular social game in the world, with 67.4 million active users. That figure far surpasses FarmVille, also by Zynga, which was formerly in the top spot at 57 million. 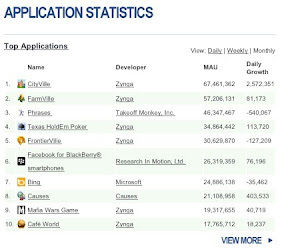 Stat-tracker AppData has been following the launch of CityVille, which Zynga released in early December. The company says the game had 300,000 users in just its first 24 hours. Overall, including FrontierVille, MafiaWars, FarmVille and others, Zynga now has 269 million active users playing their games on Facebook. Zynga has 6 of the top 10 most used apps on Facebook.